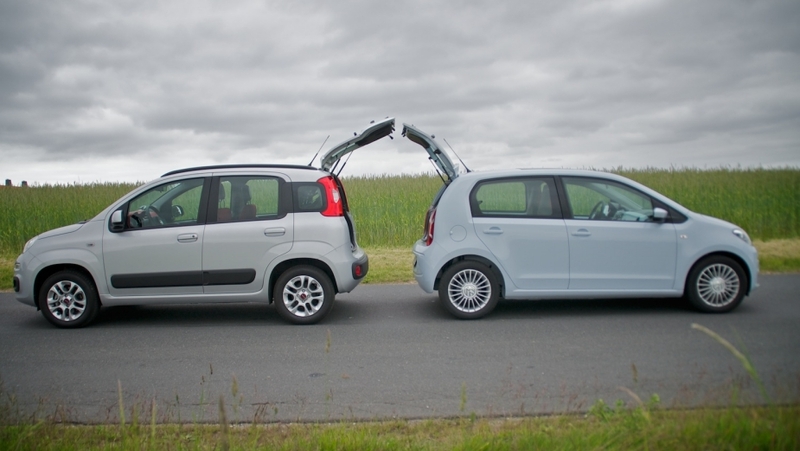 Italy’s bad results affect Fiat 500-Panda in its battle against VW Up! 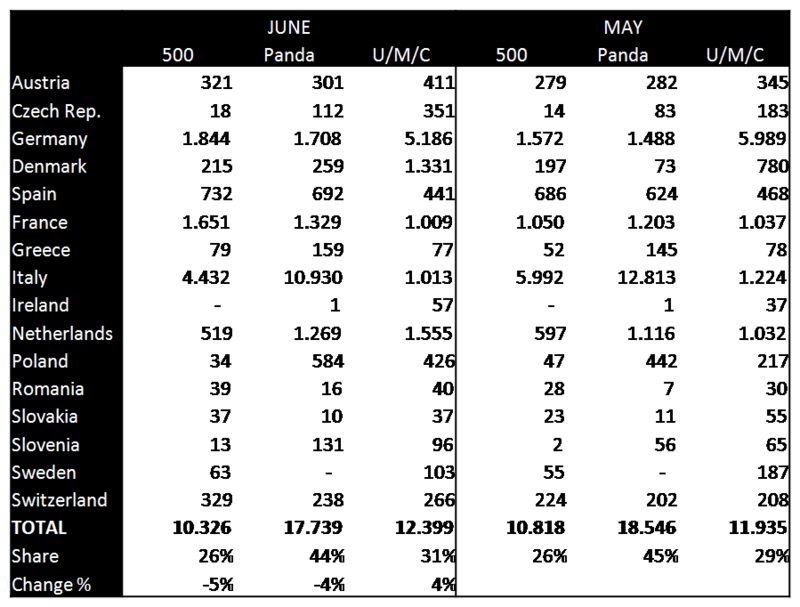 Once again the monthly report about the impact the small car of VW is having on Fiat 500 and Panda’s sales. In June things got worse for the Italian couple because of only one country: their native Italy. Compared to May figures, the 500 and Panda grew in most markets except for Italy, where both models falled 26% for the 500 and 15% for the Panda, against the VW Up! which was down 17% in that market. The stong fall in Italy made total European market figures to go down 5% and 4% for the 500 and Panda, while the VW was up 4%. Certainly without taking into account Italy, both Fiat would have had much better results, specially in Germany and France. The 3 models of VW, Up!, Citigo and Mii, got record sales numbers in Germany, which counts for 42% of its total sales. 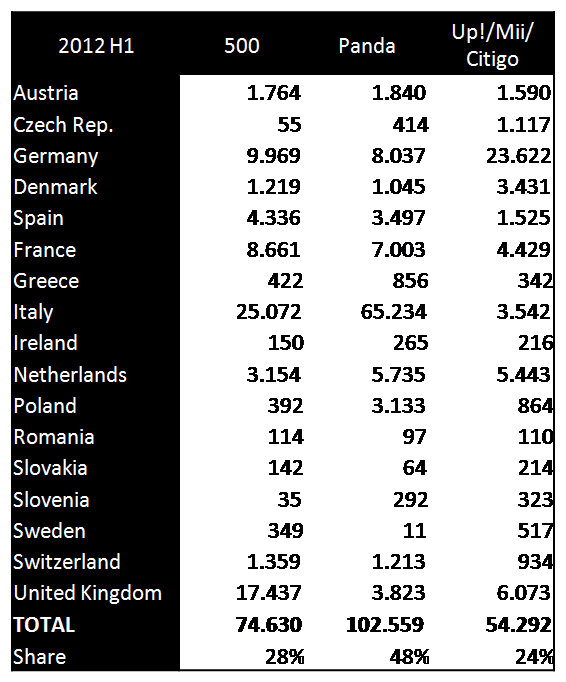 Meanwhile Italy represents 43% of Fiat 500 sales in Europe (the UK is not included) and a massive 63% of Panda figures. At the sixth month of the year, the VW beated the Fiat couple in Austria, Czech Republic, Germany, Denmark, Ireland, Netherlands, Romania and Sweden. For the first half of the year the situation is still good for the Italians as they combined sold 3.2 times more than the 3 VW. The Panda continues to be the best selling A-Segment car in Europe but it is really dependant on Italian market, something not good nowadays. The new generation is doing good but not as the second one, which was on sale during better times. The Fiat 500 is also doing good but the arrival of the VW trio will continue to impact its sales and maybe could lose its second place among A-segment cars in Europe. If the UK is included the results are better for Fiat, specially for the 500, which has been in the top 10 for 2 consecutive months and is 12th best selling car of that country. In that case the Panda would continue ruling with more than 102.000 units, followed by the 500 with almost 75.000 (23% of them sold in the UK), and then the german trio with more than 54.000 units. These results can be analyzed from several points of view. For example, the VW cars are completely new cars coming from Europe’s largest car maker and offering 3 and 5 doors. In the other hand the Fiat 500 is pretty old, with more than 5 years in the market and a bit more expensive. Anyway the couple from Fiat must work harder to keep their place in the ranking. VW will lead in Germany, Denmark, northern Europe, Austria and the Netherlands, but Fiat must keep its position in Italy, France, Spain and the UK. it seems to me that the situation is not that bad…first of all you count up/mii/citigo as one model but, even if identical, they’re statistically considered 3 different models (being produced under 3 different brands), secondly it was pretty obvious that in germany (and some other countries nearby as the czech rep.) the up would overtake the panda/500. the problem would be if in italy (the only major european market, talking about the A-segment) the up would start selling in high volumes, but, by now, it is not happening. basically, considering the very bad situation of the italian market the panda and 500 in europe are not doing that bad…in the uk the 500 is selling more than ever. maybe the panda, being a new model, hasn’t made any real impact as such, abroad. what is sad is to notice that in some markets (especially in northern europe) people prefer the german one just because it is german and they don’t even take a glance to the panda. anyway i found interesting one of your last comments on those cars, when you said that Fiat should be very successful in the other global markets where the A-segment is strong, such as India. i can add that, in partnership with a japanese firm (maybe Mazda) the Panda would be successful in many asian markets, as southeast asia (and in a japanese-branded version, even in Japan). Hi Jack. Thanks for your comment. I totally agree with you. It’s true I am comparing 3 ‘different’ models with two Fiat. It is also true that what’s happening in Germany and other ‘Germanized’ markets is normal and VW rules over there. But consider that the Panda is a totally new product and has been in European top 10 only 2 times in 2012 so far. Certainly Italy is a great market for A-Segment cars but as the situation over there is getting really tough Fiat must sell their mini cars abroad.